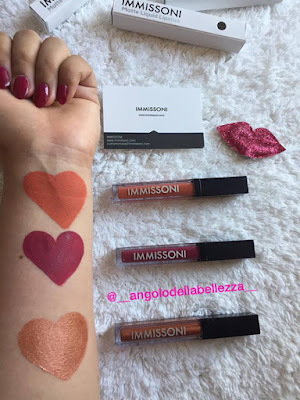 Today I show you the three colors I received from IMMISSONI Cosmetics, an English brand with whom I had the pleasure to collaborate this month. The company, gave the opportunity for collaborations, made by selection, and chose 20 bloggers, and I am very happy to be among the 20 chosen girls. So I want to thank the company again for giving me this great opportunity, I hope I can work with them again, because I really love their products! The color pack is really simple, cute and functional, this is because they have a small fork through which you can still see the color before the product is opened. It's all shiny white, with black and silvery writing, it's very minimal, but effective. The colors contain 5 g of product and have a PAO of 12 months, and have a cost of £7.99 one. As soon as I saw it I said, "No I will never come out with this color absolutely", but then I tried it and I liked it though it was so orange. I usually never use these particular colors. 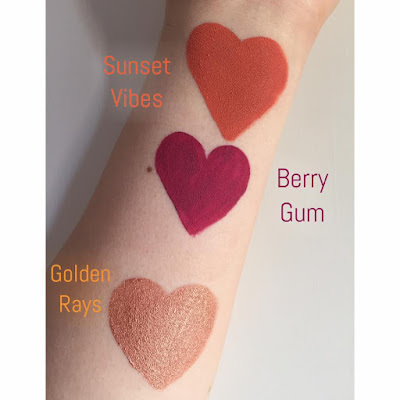 But then I mixed it with Berry gum, with Golden rays and came out of spectacular colors, it's so rich and I recommend it especially for summer! It dries up really early and becomes super opaque, so I suggest you apply it to edges first, to avoid mistakes near the edges. This color is really beautiful, it is a super pigmented bordeaux since the first pass, plus it does not transfer and it really lasts a lot of hours! I applied it yesterday and it lasted about 5 hours, resisting water, kisses, cigarettes and some food. 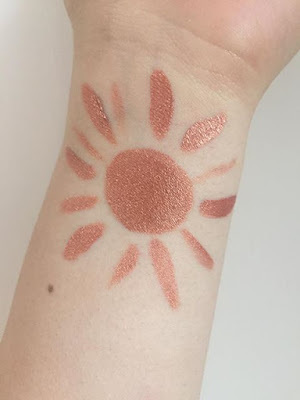 This color is metallic, it is a really brilliant bronze gold, but I have used it as an eye shadows and I have to say I liked it very much, although I did not like the warm colors on me, I had to be rewritten because It's really amazing! 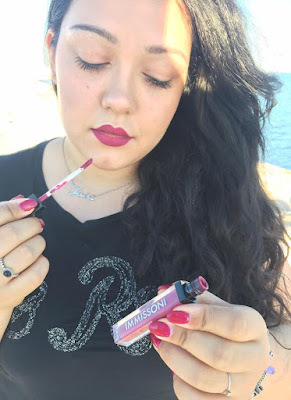 On my lips, however, does not make a lot, having dark complexion, the color does not see much and so I think it will be the eyeshadow of the summer and I will use it to illuminate the central part of my lips when I get dark bases. Surely they are great colors, especially the value for money is unbeatable, I have tried other more expensive and they were absolutely disastrous. I can tell you now that they are good colors, last so long, they are comfortable, they do not stick, and they have lasted me for at least 5 hours! So I can only tell you that you absolutely have to try them !! I can not wait to make an order and also get the IMMISSONI eyeshadow palette online when its released!